The Atlantic Seaboard Wine Association annually puts on a formal Reception with the Congressional Wine Caucus, the only reception sponsored by a regional wine association with the Congressional Wine Caucus. The Congressional Wine Caucus was formed in 1999 with the goal of emphasizing to Congressional members the importance of the wine industry in their respective districts and to allow the public a focus for industrial needs and requirements. There are currently over 215 members from both House and Senate who belong to the Congressional Wine Caucus. The original founders of the Wine Caucus were George Radanovich (R) from the 19th Congressional District in California and Mike Thompson (D) from the 1st Congressional District in California. Mike Thompson remains the democratic co-chairman of the caucus. With the retirement of George Radanovich, the Republican Co-Chairman of the Caucus is now Dan Lungren from the 3rd Congressional District in California. The Congressional Wine Caucus has been supportive of the efforts of the Atlantic Seaboard Wine Association to promote the East Coast as a quality wine producing area which is in line with the charter of the Caucus. 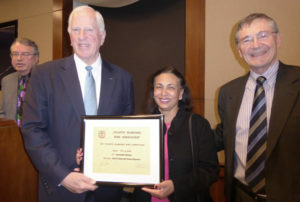 Representative Mike Thompson has sponsored in the past the Association’s annual award ceremony on Capitol Hill to permit attending award winning wineries to receive the competition’s Best of Show Trophy and the Competition’s Best of Category certificates from their respective Congressman. The award ceremony is held after the July competition, usually in the late Fall. Stephen Heyns and Saam Bakhtiar accept the Jefferson Loving Cup Trophy for the 2018 grand prize winner CrossKeys Fiore 2017. The 14th annual Congressional Reception awards ceremony was held on December 17th at the Longworth Building on Capital Hill. Stephen Heyns and Saam Bakhtiar accepted the Jefferson Loving Cup Trophy from ASWA President Grant Crandall for the grand prize winner ASWA Wine Competition 2018: CrossKeys Vineyards Fiore 2017. This rosé wine is composed of 70% cabernet franc and 30% chambourcin, and was made with estate-grown Shenandoah Valley AVA fruit. It shows a rich fruitiness balanced with savory herbal notes. Grapes for the wine were whole-cluster pressed and fermented in stainless steel. Owner/Winemaker Sudha Patil accepts the 2017 plaque for Best of Show from Mike Thompson, Chair of the Congressional Wine Caucus. ASWA President Grant Crandall is on the right; Competition Chair / ASWA Secretary Dave Barber is at the podium on the left. The 13th annual Congressional Reception awards ceremony was held on the 13th of December at the Longworth Building on Capital Hill. BEST OF SHOW in ASWA’s 2017 competition was 2013 Cabernet Franc Reserve from Narmada Winery in Amissville, VA. The competition issued 73 gold medals, 165 silver medals and 148 Bronze medals. A bottle of the Best of Show wine, Pollak Vineyards 2014 Cabernet Sauvignon. 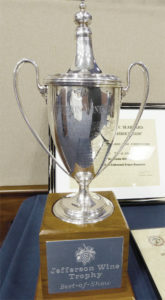 The award ceremony for the winners of the 12th annual competition was held on the 15th of December in Congressional Reception, Room 1300 Longworth Building. Over 200 Congressmen, Chiefs of Staff, Legislative Assistants, staffers and winery representatives attended the event. 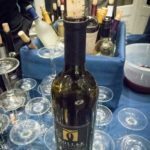 In addition, members of the ASWA and cadre from the Brotherhood of the Knights of the Vine poured poured top award wines for the attendees. 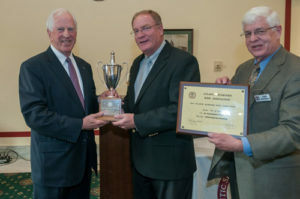 Congressman Mike Thompson ( left) Democratic Co-Chairman of the Congressional Wine Caucus from California awarding the Best of Show Jefferson Cup to Frederick Frank (center) of Dr. Konstantin Frank Vinifera Wine Cellars in New York for his 2014 Semi-dry Riesling. 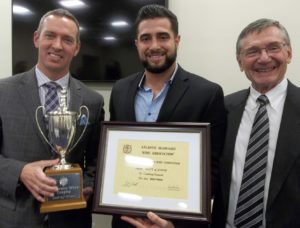 ASWA President Carl Brandhorst (right) is holding the certificate that accompanies the Jefferson Cup. The award ceremony for the winners of the 11th annual competition was held on the 22nd of October in Gold Room, the Rayburn House Office Building. Over 200 Congressmen, Chiefs of Staff, Legislative Assistants, staffers and winery representatives attended the event.